Carey Miller, with a BA degree in Animal Behavior from Cornell University, has been a certified farrier since 1986, having studied with Danny Ward at the Eastern School of Farriery. Caper Lea Farrier Service has a home shop set up to accommodate forge work, welding and specialty shoeing needs. 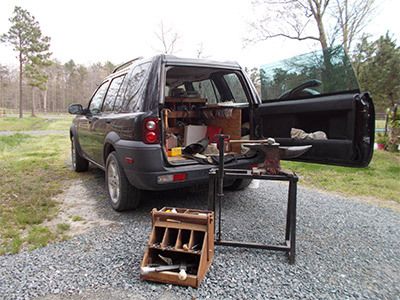 Caper Lea Farrier Service also has a mobile shop for farm visits to your horse. Caper Lea Farrier Service promotes soundness for your horse with an inventory of Natural Balance shoes in steel and aluminum. 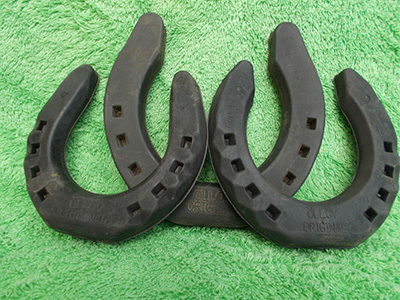 Caper Lea Farms carries Natural Balance Horse Shoes as well as Easy Care Hoof Booting. 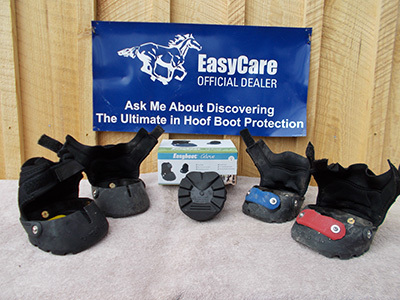 Additional information about Easy Care Hoof Booting may be found at www.easycareinc.com. EDSS Natural Balance shoes are often used in the farrier practice at Caper Lea Farms. There is great traction offered by the fullering, the wide web of the shoe at the toe area, the built-in toe roll, and the great sole-relief on the foot-side of the shoe. These shoes also come in aluminum which wears easily for the horse that needs to finds its own "break-over" point. It is a lot of shoe in a very light-weight package. The steel hind pattern of the Natural Balance shoe is also immediately comfortable for any horse. Another great shoe from EDSS is the Aluminum Wedged Performance Leverage Reduction shoe. This gives great support and allows a good roll in any footing. We also stock and apply the Ollov rubber shoes from Sweden, especially developed for horses ridden or driven on the black-top. 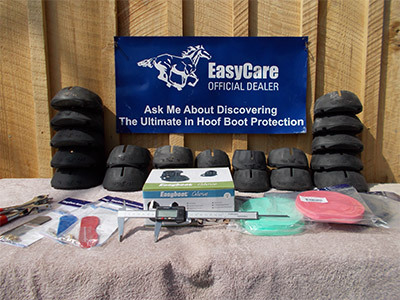 Caper lea Farrier Service is now an official dealer for EasyCare Easy Boots. 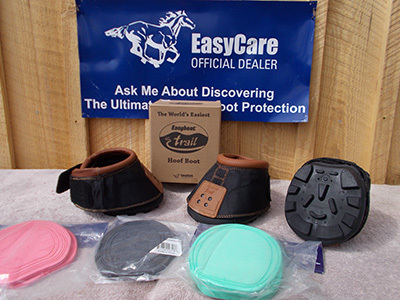 We promote and stock the Easy Care Glove, the Trail Boot, the Back Country Boot and the Easy Soaker Boot. Every horse does not need shoes, however if we ride our horses (or drive them) we do need to consider our responsibility to offer them protection for their feet. The key to success with hoof booting is in the fitting. Caper Lea offers this boot fitting service and we keep many sizes of these boots in stock. 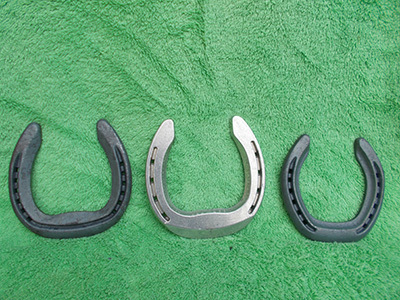 Hoof booting is an excellent solution for the temporary hoof protection dilemma. This is the EasyBoot Glove. 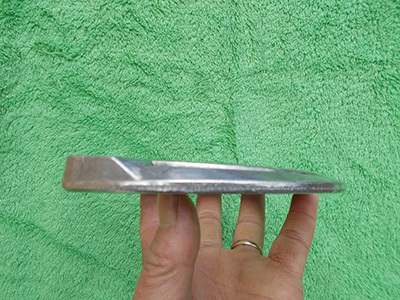 The ground surface is designed for support and traction. They are very tough boot shells and will last for miles! It is ideal for the well-maintained barefoot hoof. The gloves on the right have been outfitted with "power straps" which add some stabilizing rigidity to the fit when needed. The boot-shell itself comes to within an inch or so of the coronary band, there are NO metal hooks, cable wires or clamps to deal with. The "gaiter" is padded stretchy neoprene with a Velcro closure that wraps around the pastern. The trick to success with these is in the fitting. 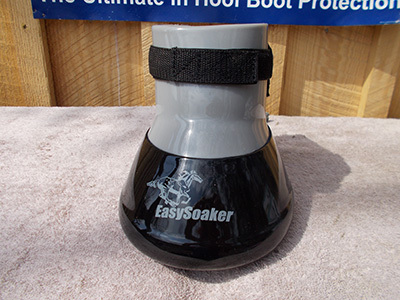 This is the EasyBoot Soaker model. It can come in handy for the busy person responsible for soaking for a hoof abscess, for instance, when there are a lot of other tasks on that to-do list. It will NOT tip over! It is also used for soaking, poulticing, or keeping bandages clean and dry. It is waterproof. This is the EasyBoot Trail model. This is a great horse caregiver-friendly hoof boot. It is a really good solution for the bruised hoof or slightly tender-footed horse who needs re-hab time with some easy to put on, easy to take off hoof protection. Thick pads will fit inside for added sole relief. 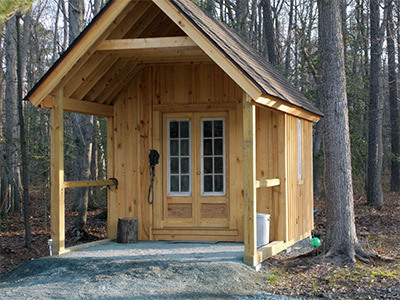 It is perfect for the casual trail and backcountry rider. Caper Lea, Inc. and Carey Miller have been a distributor for Life Data Labs products for over twenty years. 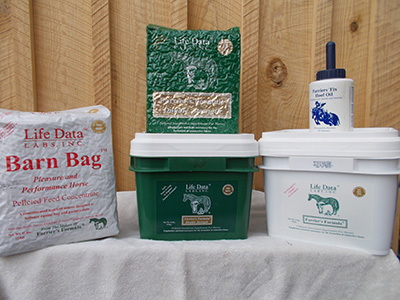 Life Data Labs developed and produces high quality and very effective hoof supplements. Information about their products may be found at www.lifedatalabs.com. Caper Lea Farms supplies and keeps in stock the original 11 pound tubs of Farrier's Formula, the 11 pound tubs of double-strength Farrier's Formula, the 11 pound foil packs of the double-strength Farrier's Formula as well as the 11 pound foil packs of the Barn Bag supplement. Great hoof health comes from the inside. Balanced nutrition is the key. These supplements zero right in on balanced nutrition. Caper Lea Farms also carries Farrier's Fix Hoof Oil which is Venice of turpentine based and has the aroma of wintergreen from the wintergreen oil it lists as an ingredient. This "oil" will not cause the hoof to go "punky" and soft as many hoof-oils tend to do. This product acts as a sole hardener.